Dolly RSVP set includes the petite A1 Pearl White pearlescent envelope and matching RSVP card. RSVP card in shimmery Pearl White pearlescent cardstock measures 5x3.5 inches. Papers for both the RSVP card and envelope come from Italy. If you print, the rsvp card comes 4 to a sheet, so you print and cut. If we print, we cut to 5x3.5 inches. Templates for both parts comes with the kit. Pearl Italian pearlescent cardstock. 105 lb weight, 8.5x11 inches. You can print 4 maps or reception cards per sheet. 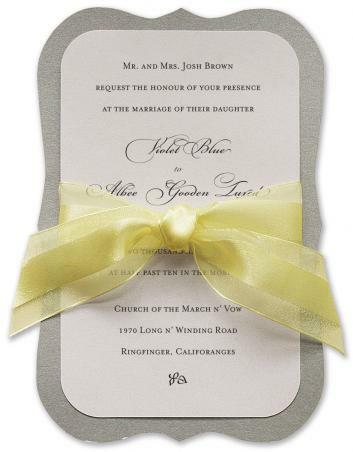 Silver and Yellow Vintage Chic Layered Wedding Invites with shaped diecut parts that neatly tie together with a vintage style ribbon. Very Generous size: Full invitation measures 8 inches x 5.5 inches wide. (A8 size). Your DIY tasks: Glue Invite to Mounting Card, thread ribbon, tie. Easy do-it-yourself project. Invitation card is mounted onto a deicut vintage printer's ornament shaped backing card, with diecut slots that the ribbon threads through. RSVP and any other enclosures get stacked at the back, held by the ribbon. Mounted with fabulously easy to use glue dots. (glue dots included) Very chic! DIY imprintable card. Very affordable, too. Generous A8 size, mailing envelope is 6 inches x 8 inches. Outer envelope: A9 OuterPEARL WHITE pearlescent envelope is available for extra charge, if you want to do a double envelope. Gluedots:Gluedots for mounting the layers. Mailing Envelope:Matching Pearl A8 70lb pearlescent envelope from matching Italian paper. Microsoft Word templates for printing if you pan to print these yourself. An extra 10% of the cardstock and envelopes are included for printing overage.